Digital downloads from AtmosFX are compatible with both Mac and PC computers. We use the MP4 file format for all of our videos, so as long as you can play MP4 files you’ll be all set. Most computers already include software that can play MP4 files, but sometimes decorators need to download additional software. Also, some programs can play the files but will not let you make custom looping playlists of your decorations. There are so many programs available that can play video files, so it may be hard to pick just one. You should research to find out which program works best for your needs. If you're not sure, one solution that has worked for many decorators is a program called "VLC". 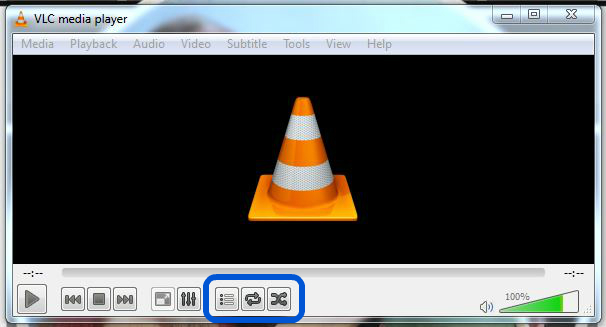 To set up your looping playlist, locate these three buttons on your VLC window. The middle button toggles between looping modes. Pressing it once will loop one file, pressing it twice will loop all files, and pressing it a third time will turn looping off. The third button toggles random playback of your playlist. In the top menu bar, go to the "VLC" dropdown menu and select "Preferences"
This will disable any subtitles from popping up.